Heading off on a whirlwind tour to Latin America and not sure what to do if a llama chats you up at a bar? Wonder no more! We’ve got the lowdown on how best to interact with animals on your wildlife tour, historic discovery tour or sightseeing bonanza. Because when they say you should always interact and socialize with locals when traveling, they weren’t talking about the fauna. So how does one interact with wildlife when traveling anyway? One doesn’t. 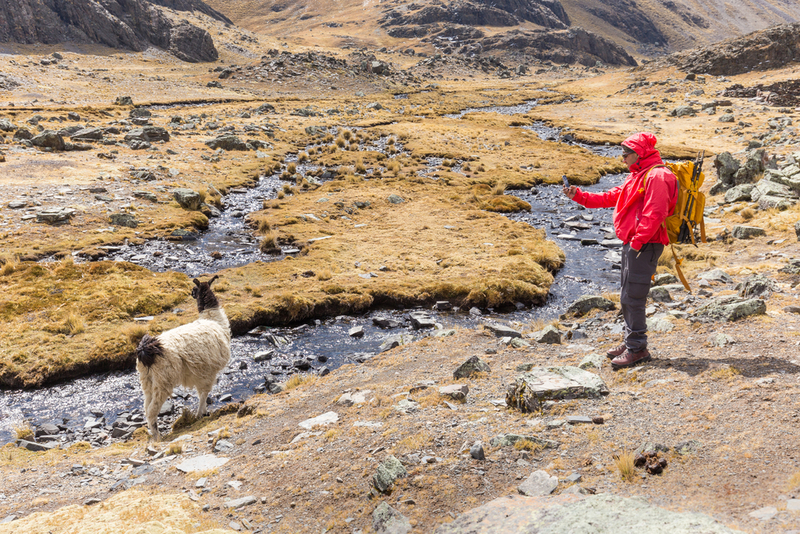 These two words just about sum up the best way for travellers to ‘interact’ with wild animals when traveling anywhere in the world, especially South America and Antarctica, where wildlife abounds. However, this probably doesn’t help us very much, especially not in those rare circumstances when it’s the wildlife which seems adamant in interacting with us. Not in a bar, naturally, but more like in pristine environments where animals roam free and have no qualms about close contacts with humans. 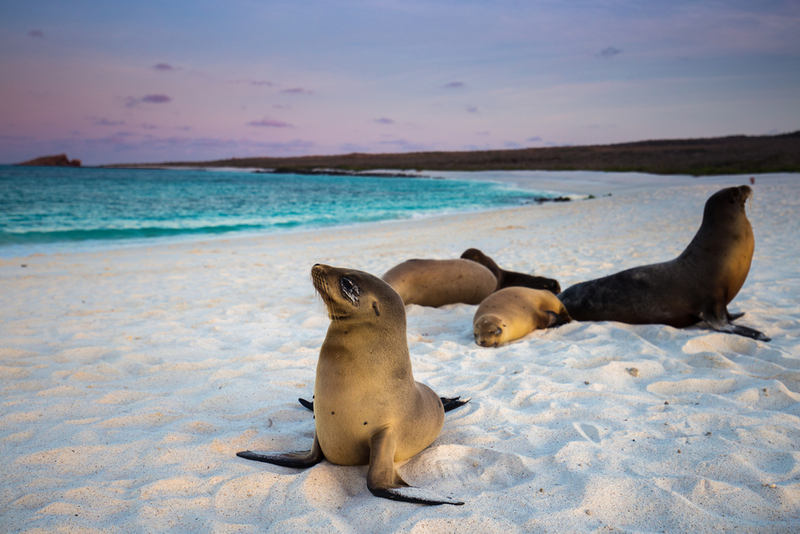 The Galapagos Islands are a prime example. This pristine archipelago off the west coast of Ecuador IS home to a phenomenal concentration of wildlife; creatures that have never been hunted, have developed no fear of humans and are, if anything, insanely curious about what kind of funny creature you may be. It’s not uncommon, for example, for a seal pup to walk right up to some excited visitor on a beach in the Galapagos, hoping to get a suckle of their little toe. This kind of close up encounter is what makes this chain of islands such an unrivalled wildlife destination. Yet cute as that scenario may be, the question begs: what should you do if an up close and personal encounter with a wild animal is imminent? Needless to say, the first course of action should be to steer well clear of any animal’s path. 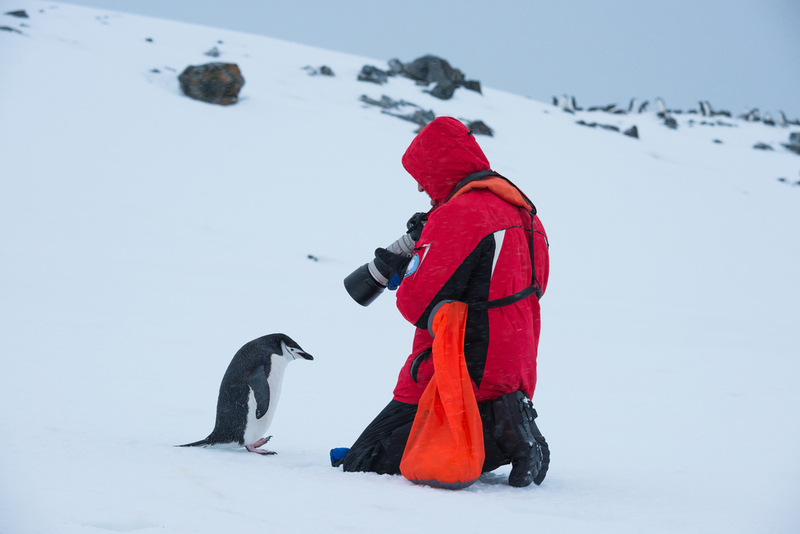 In heavily restricted and monitored destinations like Antarctica, there is a very detailed guideline as to how close you can get to the wildlife, and what you’re allowed to do. The first two days on an expedition cruise to the White Continent are taken up with various presentations and lectures about how you should behave once you set foot on Antarctica, and how you are expected to behave around wild animals. So that part’s easy. Of course, not every destination is as closely monitored, so using common sense everywhere else will be greatly beneficial. Never approach a wild animal, no matter how small, never ever reach out to touch them – even if those big googly baby-seal eyes are begging you to – and never pick up ANY animal to take a selfie. That’s what we mean by common sense! There are plenty of ways to admire the wildlife of a destination without causing them untold grief. So make sure you pack a zoom for your camera and you can admire the wildlife from a distance and still take home a seriously wicked photograph or 100. Many people think it reasonable to get very close to a tree on which a bird has nested, in order to take close-up pics. But in fact, even several metres’ distance can be immensely disturbing to a sensitive nesting bird. The most important thing to remember about birds is that they are in fact quite tolerant, except when confronted by loud noises and sudden movement. If there’s a particularly special specimen you want to photograph, then move slowly, set yourself and your camera up in an ideal location (well below the nest’s height) and wait. Slowly does it. You’ll get the pic you desire and the bird will feel secure enough to go about its nesting business. And do keep in mind that if a bird starts chirping excitedly at the sight of you, he’s probably doing so out of distress and not celebration. Back off to a more desirable distance (for the bird) and try again. A bit of patience and an adequate distance will make for immensely rewarding viewing. First of all, only Fido responds well to a human whistle and even then, only 50% of the time. Calling out to wildlife is akin to harassment and although your wildlife guide will no doubt give you a rundown of things you’re allowed to do, this one seems to be almost a very difficult thing to not do when wanting to capture a gorgeous animal on film. Try and catch yourself before you make any noise and, instead, rustle some leaves nearby you to see if it will take the animals’ attention and entice him/her to look your way. Perhaps a better action would be to do nothing at all and simply wait for that perfect moment, compliments of nature. Even the fluffiest cutest creature will become a murderous beast when separated from its young, so be mindful of your location and make sure you’re not inadvertently separating mum & bub. If you find yourself in this situation, get out of it slowly and with as little commotion as possible. Once you see that mum and bub have plenty of space, but curious baby still wants to come up to you to figure out what kind of funny creature you are, then crouch down low and enjoy the attention. You need not be an expert to be able to read when an animal, any animal, is in distress. Very loud calls, sudden movements, flicks of tails and grunts are pretty good signs that a creature has been bothered. If there is any doubt in your mind that you, or your fellow tour companions, are the cause of the animal’s distress, then take evasive action and retreat to a greater distance. When it comes to marine wildlife, the recommended distance is about 100 metres. 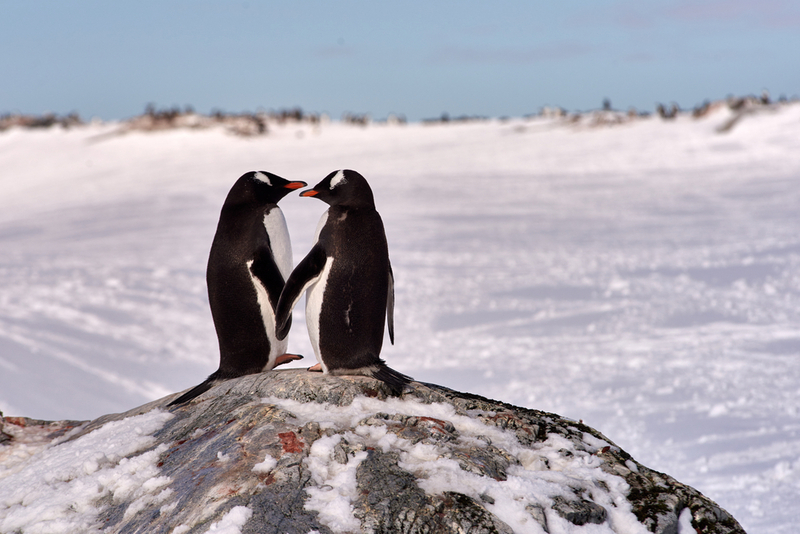 You can get much closer to the wildlife in Antarctica, which is one of the aspects which makes this one of the world’s most insanely rewarding destinations for wildlife viewing. If Spanish conquistadores managed to wipe out the Incas with smallpox, imagine the havoc your cold can have on a colony of seals? You don’t need to be plagued by some contagious horrid illness to have detrimental effects on an animal’s wellbeing. Even just a common human cold can have devastating consequences for a creature with no immunity to it, and for its pristine environment. Be aware of yourself and your own health, and skip a day of wildlife viewing if you have a stomach upset or viral disease. The animals and the environment will be ever so grateful. Sometimes, we’ll see a group of visitors all doing the right thing, except they are so spread out over a small area that they have inadvertently ‘blocked off’ escape routes for the wildlife, should it wish to move on. Be aware of how much your group is spreading out, how much space you have and, more importantly, how much space the animals have. Stick together, whether on a walk or a kayak, and not only will the animals be more relaxed but you will be much safer too. Some see wildlife behaviour etiquette as sheer ‘good manners’ while others think the only thing required is some common senses. There are some creatures you should never ever approach. Like, say, polar bears in the Arctic or howler monkeys in the Amazon. Others, however, like a curious llama, requires a much less stringent code of behaviour. 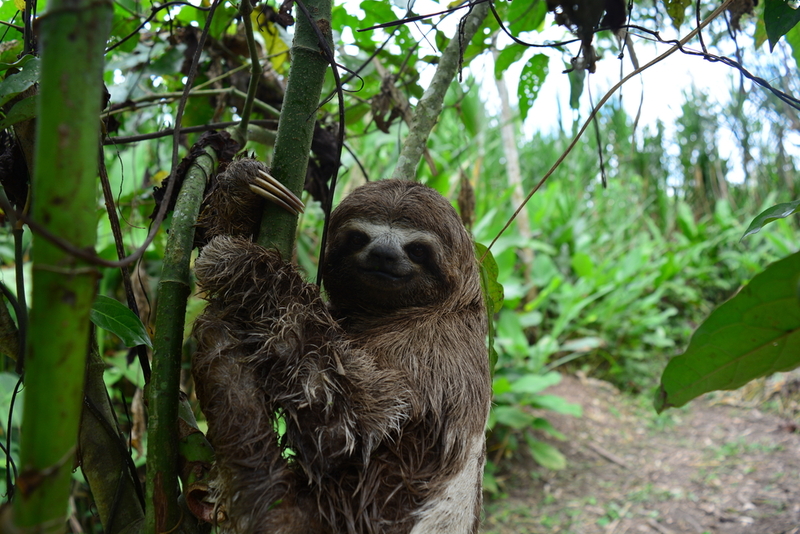 Not sure how to approach each animal you meet along your travels in Latin America? Find out! Knowing more about a particular animal will help you realize if what you’re doing is likely to cause him/her grief. At the end of the day, when it comes to interactive with wildlife, it all comes down to the wildlife itself. The best course of action is to let the animal decide what kind of contact he/she wants with you, and how close it wants to get. I’ve had a seal in Peru flubber over to me and plonk itself on top of my foot and take a snooze – I had to slowly extricate my foot from under its belly, I’ve have had a toucan literally sit on my head at Iguassu National Park in Brazil and a few penguins waddled over to me as I was changing my camera battery on a stunning beach in southern Chile. These are the most unforgettable wildlife experiences I’ve ever had in Latin America, and none of them were of my initiation. Steer clear of deadly creatures and let everything else come to you if it wants and stay away if it prefers. 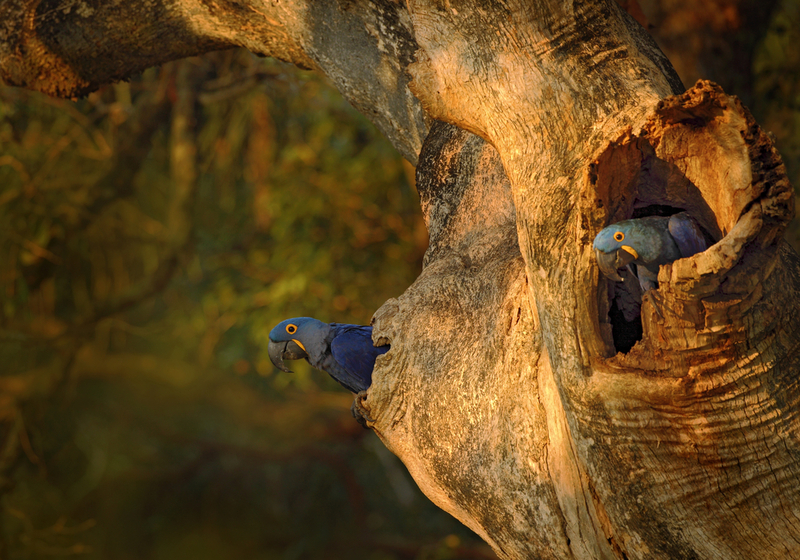 And most of all, enjoy admiring some of our planet’s most astonishing creatures in one of its most diverse continents. If you want to find out more about the incredible wildlife experiences we have on offer in Latin America and Antarctica, check out our tours and contact us for more info.